Romeo for Intel® Edison Controller is discontinued now. We recommend Intel dev Board as replacement where you might find other products interested. 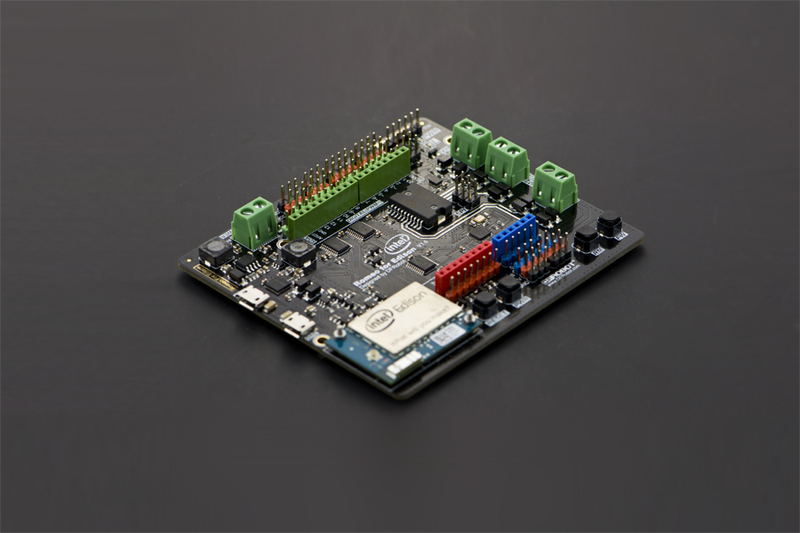 Romeo for Intel® Edison is a multi-purpose, all-in-one development platform based on Intel Edison and Arduino SoC. It is especially designed to be useful for robotics applications. Romeo for Intel® Edison is compatible with Arduino open source platform and Linux, and supports Java and C development environment. Users are able to extend this platform with thousands of existing shields and modules such as switches, sensors, LEDs, servos, motors easily with Romeo for Intel Edison. It can also be used as a standalone communication platform for software like flash, processing, Max/MSP and VVVV. The integrated 2 way DC motor driver and wireless capability allows you to start your project immediately without the need of any additional motor driver or wireless shield. The Romeo for Intel® Edison inherits all functions of the Romeo all-in-one controller and integrates powerful functions the Intel Edison board possesses. You can describe it as a control board specially designed for robotics applications, carrying the powerful gene of Intel® Edison and being compatible with Arduino.